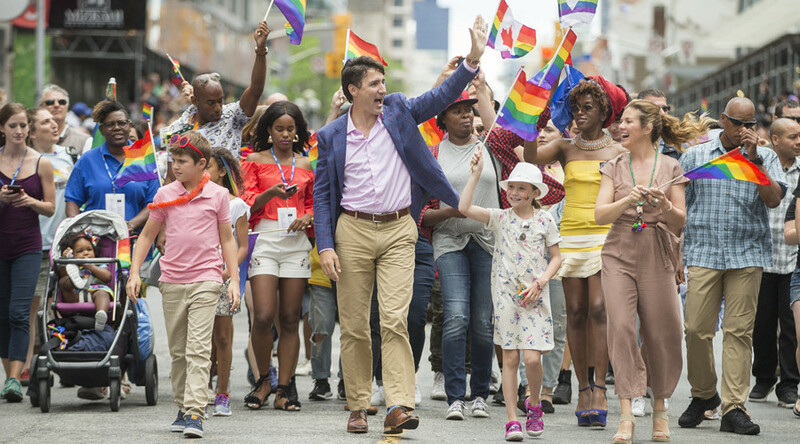 Canadian Prime Minister Justin Trudeau has created a social media frenzy after he attended Toronto’s pride march donning rainbow socks celebrating the Muslim holiday of Eid. The popular PM used the opportunity to promote inclusivity, but his words were overshadowed by his colorful socks. “This is all about including people,” Trudeau told local Canadian media. Eid marks the end of the holy month of Ramadan. The prime minister’s socks were similar to the rainbow Pride flag, but are actually Eid socks. Trudeau's display of inclusiveness and positivity which united the gay community and the Muslim community was a major hit with his fans. The contrast between Trudeau and US President Trump was not lost on people, who couldn’t help but draw comparisons between the two leaders. Trudeau attends Pride parade and wears rainbow colored socks w #EidMubarak on them. While Trump wears Orange & ignorance & plays golf. 😍 We can only dream of such a man. We have plunged into disgrace. Comparatively, Trump has failed to acknowledge Pride month, and ended a two-decade tradition of hosting an Eid dinner at the White House.